This knockout tournament was played in Khanty-Mansiysk in Siberia. Gata Kamsky is currently the highest rated player in the USA but originally came from Novokuznetsk in the USSR and so arguably had some home advantage. He was a very strong chess prodigy with an overbearing and irascible father who often issued violent threats to other players. Gata gave up chess in the last 1990s and went back to academia, graduating with a law degree.. He returned to chess in 2004 and has returned to the elite. He is currently ranked 10th in the world. This month I’ve chosen to annotate a game between Gata Kamsky and Peter Svidler from the World Cup. Not only did I find the game interesting (check out the double rook sacrifice by Svidler!) 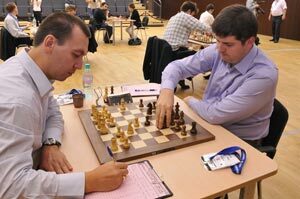 but it was also important in terms of the tournament as Peter Svidler went on to win the competition. CLICK ON THE “3 HORIZONTAL LINES” and then the Speech bubble.